Your Daydream is a Part of You. Don't Give That Up. | The girl who loved to write about life. Your Daydream is a Part of You. Don't Give That Up. The first time I saw this saying, it was on a t-shirt. Just seeing it made me tear up, because it just felt so perfect for what I was feeling at the time. I bought it and declared it my new favorite. Of course, it was from Forever 21, so I think I wore it twice before it got a hole in it, but hey. You win some, you lose some. It's a saying that has stuck with me. I've seen it on more tees, all over pinterest, painted on canvases. It's become so popular, but it still makes me feel so hopeful whenever I see it. I think that sometimes we think that if our daydream isn't paying all the bills, then we're a failure. And that's just not true. It's not all or nothing. You're not either extremely successful at your dream or nothing at all. There's an in-between. An in-between where you have to choose to not quit your dream. I don't know if I'll ever be truly successful at my daydream. But I do know that I can't quit it, because it's a huge part of me. To give up because it's not paying the bills would be a betrayal to myself, you know? 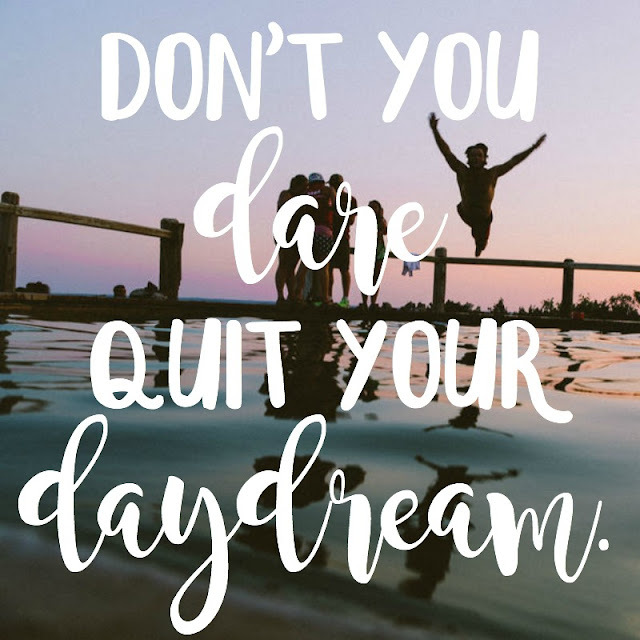 Maybe you'll be so successful at your daydream that you can quit your job and only do what you love. Or maybe you won't, I don't know. I don't have any advice for being successful at your dreams. But I do want to be someone in your corner, reminding you to not quit. Don't you dare quit. So this is just me popping in to say that your daydream, whatever it may be, is a part of you. Probably a big part of you. Don't give that up.